AKS-Labs' resellers are eligible for discounts on selected products. Resellers are encouraged to bundle these products with value-added services and charge accordingly. Significant revenue potential exists for the aggressive solution provider or reseller. AKS-Labs resellers are eligible for discounts on selected products. Resellers are encouraged to bundle these products with value-added services and charge accordingly. Significant revenue potential exists for the aggressive solution provider or reseller. 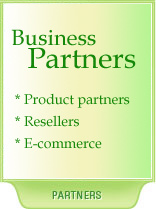 Resellers can provide clients complete solutions. After your application is processed and approved, you will receive a confirmation via e-mail.